‘Unique’ is a pretty overworked adjective these days, but here is something that I am confident is exactly that. It is a copy of my book, The Complete Dambusters, and it has been signed on the title page by both of the last two men alive who took part in the Dams Raid, George ‘Johnny’ Johnson and Fred Sutherland. I am very honoured that they both took the time to sign it, and I thank the members of both families who helped make this possible. One of the last two men alive who took part in the Dams Raid, George ‘Johnny’ Johnson, was decorated yesterday with the MBE by the Queen at a Buckingham Palace investiture. Johnson, who will be 96 in 17 days time, was the bomb aimer in Joe McCarthy’s crew in Lancaster AJ-T, which attacked the Sorpe Dam on the night of 16/17 May 1943. The other survivor is the 94-year-old Canadian Fred Sutherland, the front gunner in Les Knight’s crew in AJ-N, which dropped the final mine on the Eder Dam, causing its breach. Johnny Johnson was decorated for his services to Second World War remembrance and to the community in Bristol, where he lives. He said afterwards that the Queen told him that she was ‘glad to see that the Dambusters are still here’. Johnny Johnson has, of course, been to the palace for an investiture once before, on 22 June 1943, when he was one of the 33 men decorated by the current Queen’s mother after the Dams Raid. On that occasion he received the DFM. He must be one of the few who have an MBE to add to his collection. 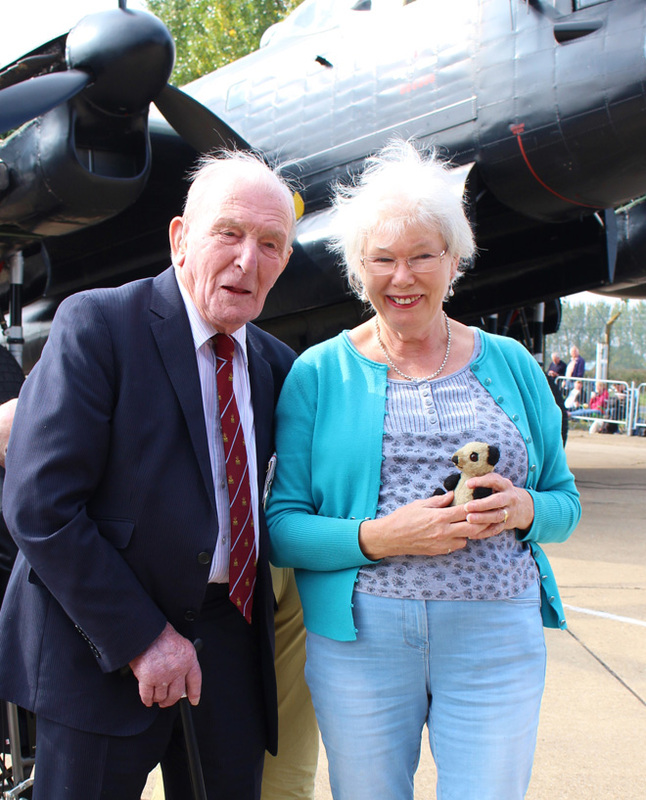 George “Johnny” Johnson came face to face again with the crew mascot who flew with him on the Dams Raid recently at East Kirkby. The small toy panda is now owned by Dorothy Bailey, the daughter of Johnny’s crew mate, Bill Radcliffe, and recently featured on an episode of the BBC Antiques Roadshow. Radcliffe was the flight engineer and Johnson the bomb aimer in the Lancaster skippered by Joe McCarthy, one of the two Dams Raid aircraft to attack the Sorpe Dam in the early hours of 17 May 1943. Radcliffe would tuck the mascot inside his flying boot before every operation, and both it and he survived the war. Unfortunately in 1952 he was killed in a car crash, back in his native Canada so his widow and young children returned to England. Dorothy and Johnny had never met before, so this was an opportunity for her to ask him about the father she scarcely knew and, of course, for Johnny to see again the little toy whose lucky life may have helped him survive the war.